Things got a bit wonky in the 1970s. Different models came in the same case and uncatalogued variations of models are known to exist. One example is the 1973 Auto Date Buccaneer and the 1973 Auto Date 5004. It has two different dials and different bracelets but the same case is the exact same. Both models feature the quick change Q/C II feature that allows you to set the day and the date at a stem position halfway between the winding and the setting positions. 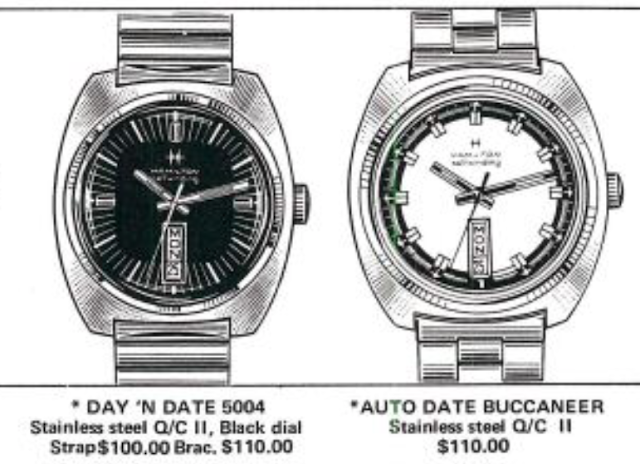 This feature is still used by Hamilton watches today. I recently received an example of one of these models that was in need of some TLC. It looks like the Buccaneer based on the bracelet but the dial is all blue. So maybe it's a totally different model? Perhaps this is a European model. This watch may look great but it doesn't wind. In fact, you can't even get the stem into the winding position... turning the crown just sets the day and date. So something is going on under the dial. This is obviously a Hamilton bracelet. The number on the back of the case is what identifies the model. This number is 825002-3 and both the Buccaneer and the Auto Date 5004 have the same number. The -3 means stainless steel. There could also be a similar case with -4 meaning gold electroplate but that would be another model altogether. Inside the case is a 17 jewel 825 movement based on an ETA 2789. The case back is marked Hamilton Watch Co Swiss... not unusual for a 1970's model. Part of the quick change functionality is derived by the helicoidal stem. Notice how the square portion appears twisted. The dial and hands are lumed with tritium, as indicated by the T-Swiss-T at the bottom of the dial. The dial is held on by clips on the main plate. You pivot them out to release the dial feet. The first challenge is to figure out how to get the calendar and day wheels off. Not really... the day wheel just lifts straight up and off. The day wheel rotates on a ring that is held in the center of the main plate. The lever on the right indexes the day wheel so it's centered in the window. Well, here's the issue with the winding... the set lever spring is under the set lever and not up against it where it belongs. Everything gets taken apart and cleaned. There are a lot of parts to a day & date model - that's for sure. The partially reassembled movement is back to ticking away with good motion. Looks like it's running great... now to fine tune the beat error a bit. There... it's running pretty much right on the money now. This watch didn't need much on the outside other than a little cleaning up. Now it's running as nicely as it looks.